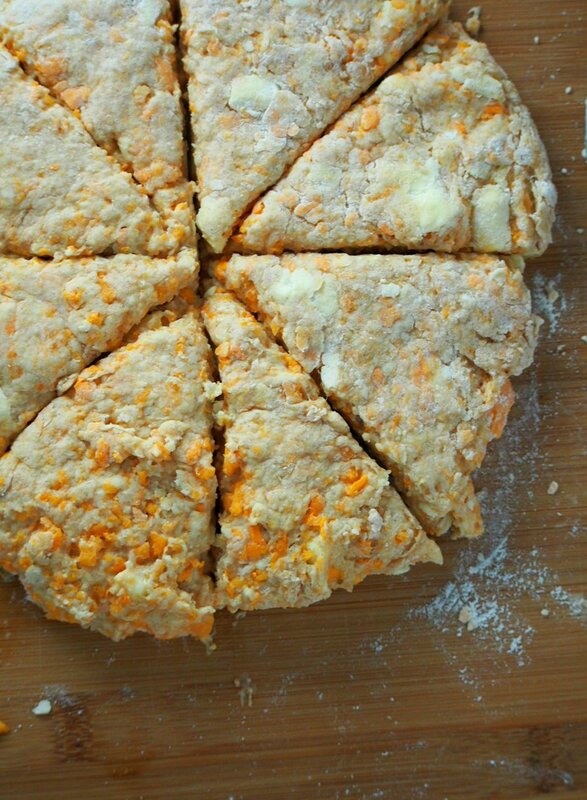 These Sweet Potato Scones are cakey on the inside and tender-crisp on the outside. 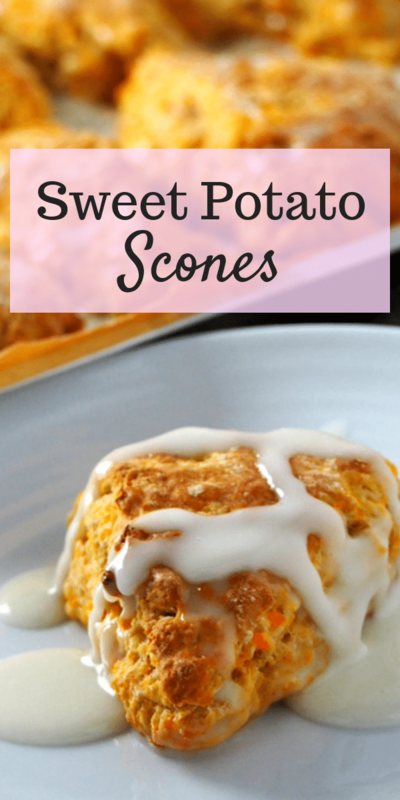 You will love these mildly sweet and buttery treats for breakfast or snack. They are a simple Fall treat! I am loving scones because they are basically a cross between a pastry and a cake. I love the buttery, flaky factor of the exterior, and I am also crazy about that interior crumb- so delicate and soft. Actually, if you ask me, scones are also an easy way to have a bread substitute without having to knead dough. 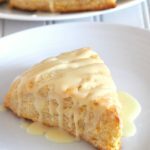 I mean, I love bread, but sometimes a quick and easy way to have something as versatile as a scone is nice, especially when you don’t have to wait for the dough to rise. Eat them plain or smother them with butter, they are a delight. For today’s scones, we don’t need any butter or jam. 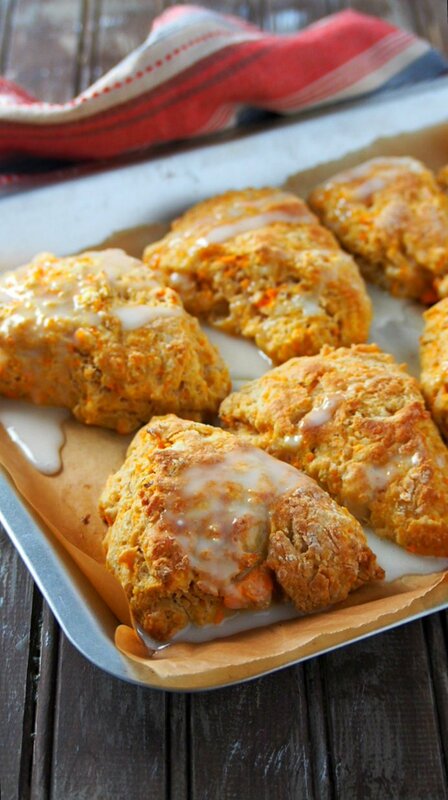 These sweet potato scones are drizzled with a sweet honey glaze. It is a perfect package- tasty, flavorful and brings about a feeling of warmth and comfort in this colder weather. 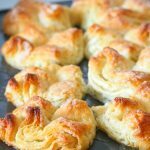 Making them is an easy method- just like making a pastry but without much complication. Make this on a weekday for a quick treat after dinner, no problem. Start by preheating your oven to 400 F. Line a baking sheet with parchment paper. In a large mixing bowl, combine all the dry ingredients: the flour, brown sugar, baking powder, baking soda, salt, and cinnamon. Whisk them with a whisk. Using a pastry cutter, cut the butter pieces into the powders. The mixture will eventually turn into a coarse meal, with little bits of butter here and there. 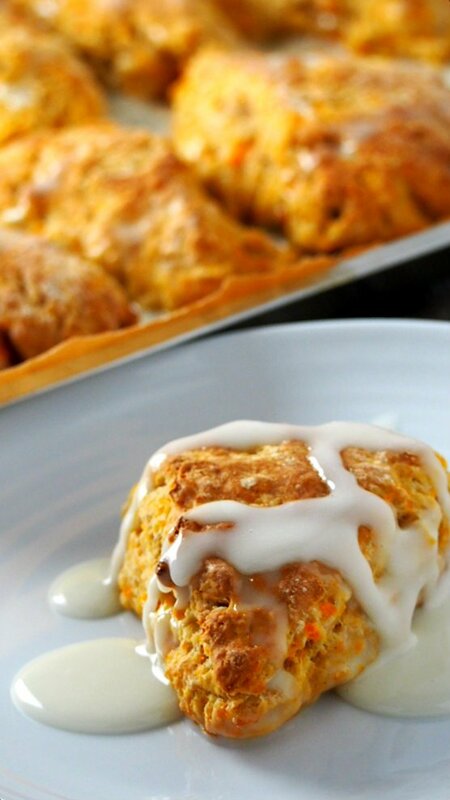 In another bowl, combine the egg, buttermilk and the mashed sweet potatoes. Stir them together until they are incorporated. Pour this mixture over the coarse meal you have created in the bowl. Stir them in, until all the powders are moistened. Now dust a working surface (like a large chopping board) with flour. Turn the dough over to the board and knead briefly, just until the dough comes together. Pat and shape the dough into an 8-inch circle. Use a sharp knife to cut the circle into 8 wedges. 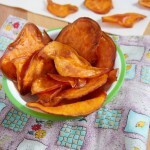 Arrange the wedges in a baking sheet that is lined with parchment paper. 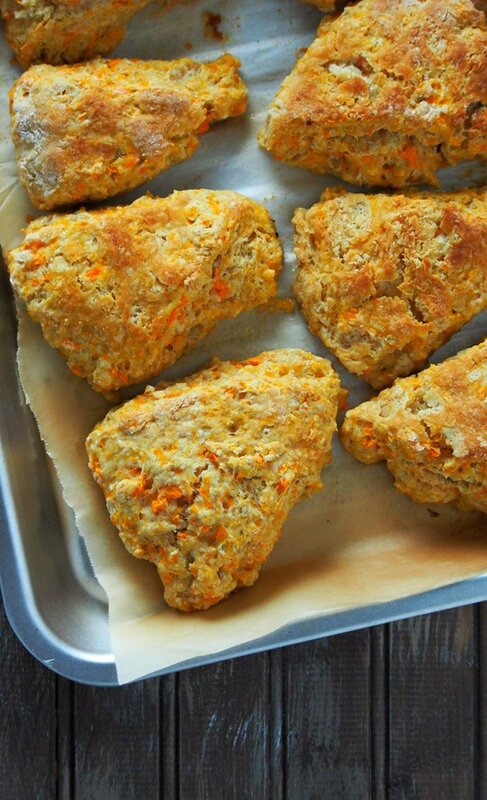 Bake the scones at 350 F for 15-20 minutes or until the scones are golden. Let them slightly cool after you take them out of the oven, then drizzle in the honey glaze over them. 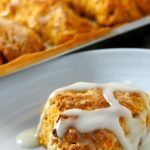 Catching bits of that glaze with every bite of the scones is heaven! I do suggest that you don’t skip the glaze. Tip: You can adjust the consistency of the glaze by adding more powdered sugar. Likewise, you can also thin it up by adding more milk. First, follow the recipe as stated then adjust accordingly to your preference. I used a medium sweet potato to yield 1 cup of mashed sweet potatoes. That medium piece weighs 300 grams. To make the mashed potatoes, peel and chop them into about 4 inches cubes. Cover them with water in a medium saucepan. Cook them until they are fork tender. Drain and mash them with a masher or fork. Preheat oven to 400 F. Line a baking sheet with parchment paper. In a large mixing bowl whisk together flour, brown sugar, baking powder, baking soda, salt, and cinnamon. Cut the butter into the flour mixture using a pastry cutter until the mixture looks like a coarse meal. 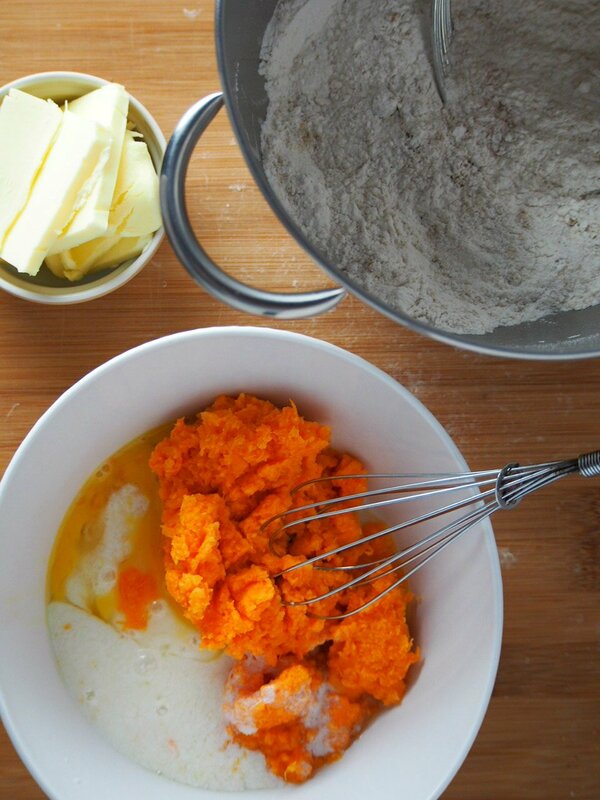 In another bowl, stir together the mashed sweet potato, the buttermilk, and the egg. Pour this liquid mixture over the dry ingredients. Stir until the powders are moistened. 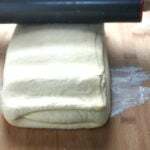 Turn the dough over on a lightly floured board and knead briefly just until the dough comes together. Pat and shape the dough into an 8-inch circle. Cut the circle into 8 wedges. Place the wedges in the baking sheet that is lined with parchment paper, leaving an inch apart in between them. 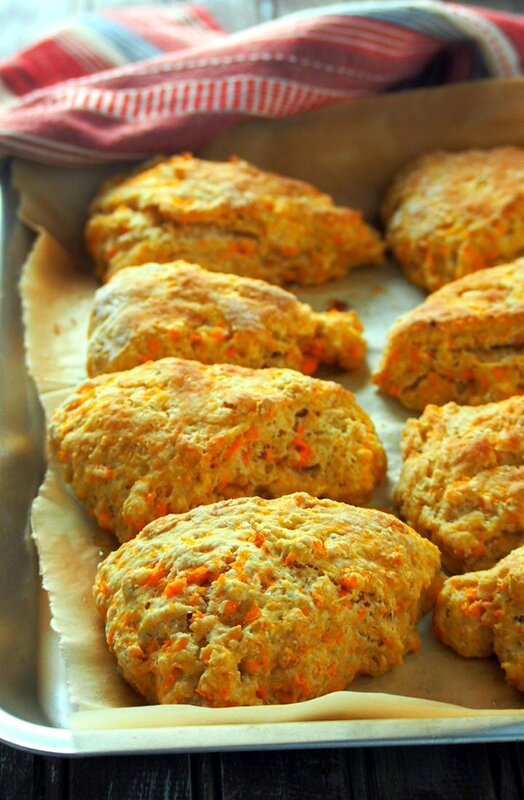 Bake the scones at 400 F for 15-20 minutes, or until the scones are golden. Stir together powdered sugar, milk, honey and salt until the mixture is smooth. If you prefer a thicker glaze, add more powdered sugar to adjust the consistency. Recipe for the scones adapted from Taste of Home. This post contains an affiliate link. Please see Disclosure Page to learn more. Oh yeah, these look amazing!